Italy is like Santa’s bag full of all my favorite toys! It’s difficult to choose just one or two when I want to play with them all. While recently re-living my photos of Italy, I chose 5 places that were especially good memories. Each of these is worthy of a visit at least once. While exploring Trastevere on a friday evening for the first time, I was surprised and impressed by the active nightlife. Caught up immediately by small street bands strumming guitars and singing while strolling past clusters of candlelit tables of outdoor diners, I was ready to join the throngs for a veritable feast. I stumbled onto Grazia & Graziella at the corner of Via della Paglia by chance. The ambience was irresistible and so I cubbied in with those already gathered around the tables. Amid the lively chatter, I enjoyed a glass of delicious white wine. Soon the handsome dark waiter brought me a gourmet thin crust cheese pizza embellished with lemon slices and sprinkled herbs. Large slices of tenderly grilled eggplant traced the side of the plate. It was all delicious. My evening in Trastevere was a swirl of lamp lit cobblestones, smiling faces, exotic smells of grilled meats and basil, all encased in a spirit of romance. 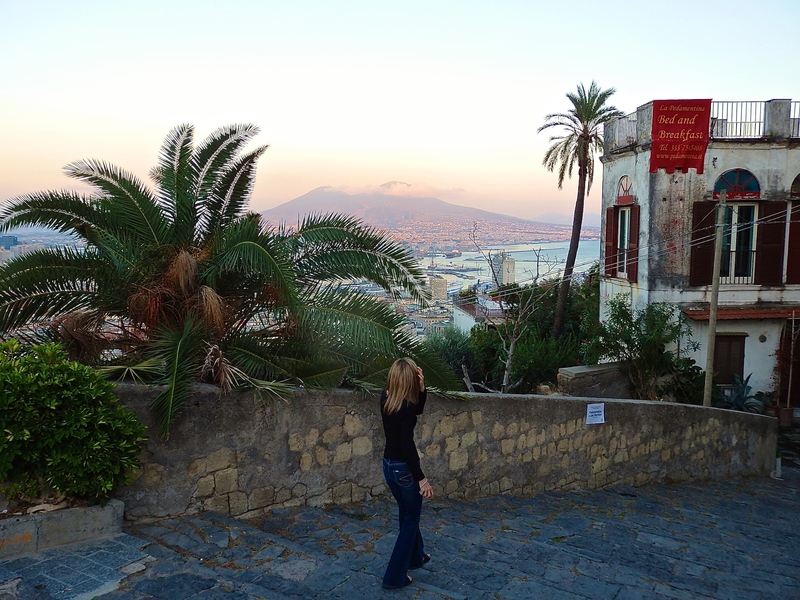 San Martino is an attractive neighborhood above the old city of Naples. It has a monastery-museum and castle that I wanted to see, so I took a funicular up from the city below for the afternoon. After visiting a cameo shop along with the museum and castle fortress, I was encouraged by Giovanni from the cameo shop to take the stairs back down and enjoy the gorgeous views. I was not disappointed. Mt. Vesuvius stood in the background, it’s top contours blurred by the pinkish rays of the setting sun. The Bay of Naples joined the sea in a shimmering blue expanse. Old buildings and short leafy palms lined the stair. Apartment buildings with open windows let out the sounds of family activity. Fragrant smells of food preparation followed. So much life was happening behind these old walls, so much activity. But I was having a memorable moment in Naples all to myself. 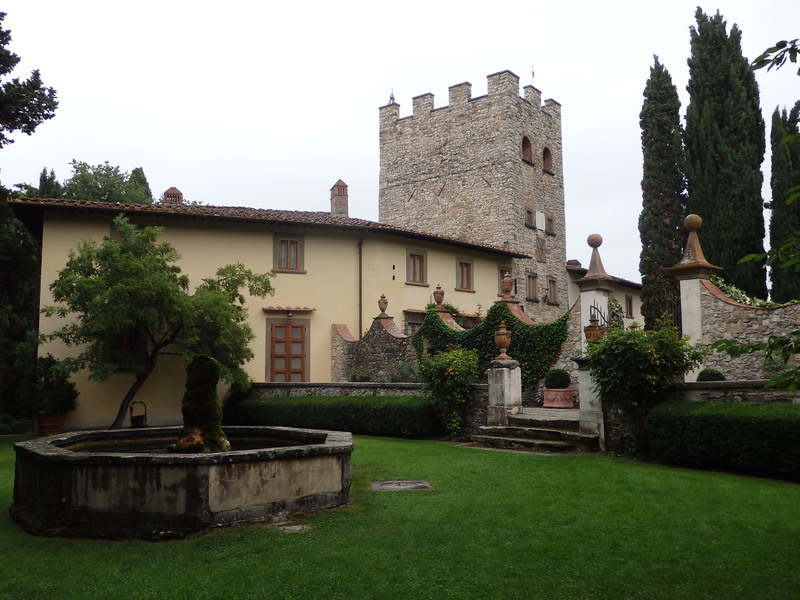 Captain Verrazzano was born in this castle winery estate in 1485. A Florentine navigator who explored New York harbor and most of the east coast in the 1500’s, New York immortalized him by naming their double-decker suspension bridge the Verrazzano-Narrows in 1964. The castle wine tour, lead by a playful young man by the name of Mateo, took us through a dungeon lined with cells. I discovered not only the Captains wine, but also hanging racks of prosciutto, small barrels of aging Balsamic vinegar, and large terracotta pots full of golden olive oil. The spirit of the Captain, who met his untimely death on an island of cannibalistic natives, was strongly felt. We all enjoyed an excellent tasting afterwards of delicious wines, thick balsamic vinegar and fragrant olive oil. 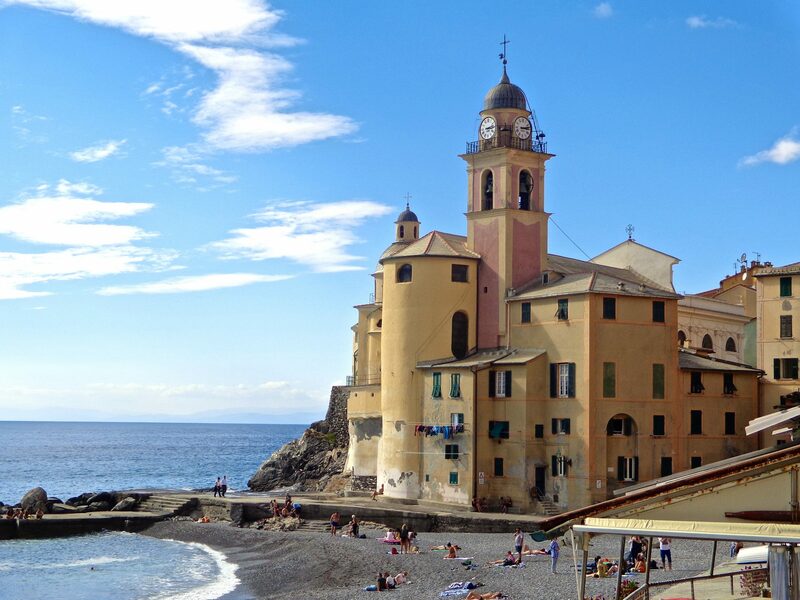 The Italian Riviera is famous for so many things from exotic yachts, famous people, gorgeous views and rich ambience. But it is always the promenade that attracts me. I love to walk along the ocean while simultaneously viewing the town. 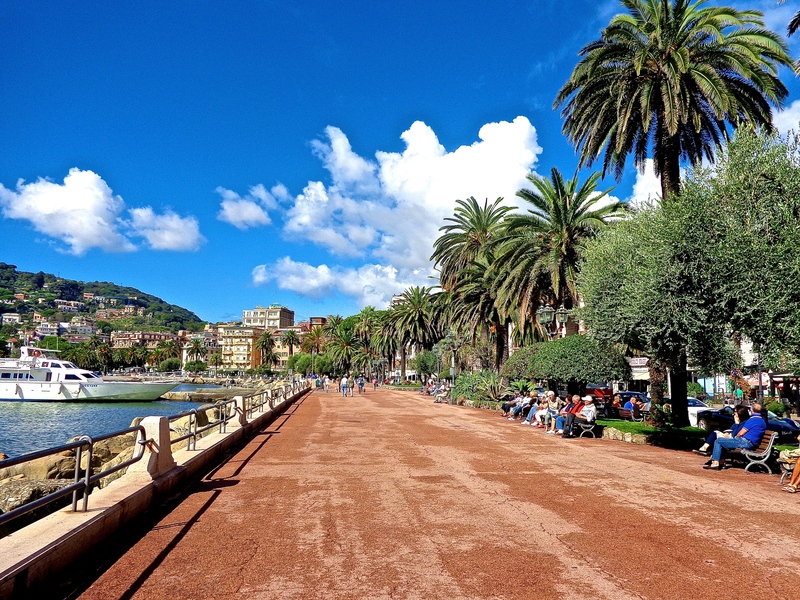 The promenade is a public walkway that is especially fun during the passeggiata, where throngs of people traditionally meet for an early evening stroll. 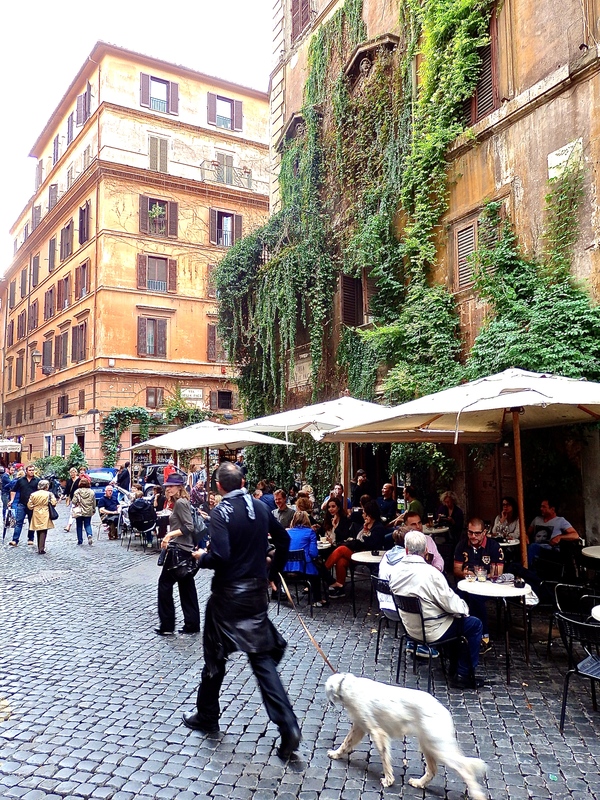 Rome has a maze of piazza’s and back streets that are so much fun to explore. Cozy outdoor restaurants and cafes bring a feeling of community that I love to get lost in. Sipping a glass of cold white wine while people watching at one of the tables is one of my favorite ways to spend an hour or two mid-afternoon or just before dinner, and a perfect way to relax. There is no end to my list of favorites and great memories of Italy. Each time I visit, I wonder how I can bring a bit back home with me. The most effective way I know of is to keep the memories alive and safely tucked away to revisit over and over again. My photo collection has become my treasure box. Come and visit us in the Marche region. You could visit Urbino, with its fascinating history, splendid architecture and great art (Raphael, Piero della Francesca) or you could visit Corinaldo, which is the perfect Italian hill-town. Anyway, I loved your 5 choices and they made me long to go back to the Eternal City. I’m always up for time spent exploring Italy! The Marche region is fascinating. I’ve so much more to see there…all with time. Wonderful list – it gives me some good ideas for the next time I’m there! Great post Susan 🙂 hard to choose 5 im sure. But for a person like me who has been to just 6-8 places in Italy. I would say- Florence, Manarola, Rome, Chianti and of course Piazza Navona and Jewsih Ghetto.. So different and yummy food! Wonderful Susan, thanks for sharing. Mannaggia this is hard but I’ll give it a go…..Orsara di Puglia, the Isole Tremiti and the entire Gargano Peninsula, Firenze and Lucca. So many more but I’d have to say these are the top! Wow! Great list…tough,I know:) The Gargano and Orsara di Puglia are on my late spring list to see. Thanks for the input! Orsara di Puglia is where I was born and I go every year. I have written a post on both Orsara and the Isole Tremiti if you want some info. More Puglia posts coming when I find some time! Buon viaggio! Just 5? Yikes! If I had to pick I would say Firenze (Florence), Aosta, Cortona, Venice, Positano. I could probably list about 50 more! Oh yes, I get ya! I have a list that long myself, but while going through my photos I chose 5 great memories and wrote about them. They are 5 of the 50 + – fave places! Very nice choices and great photos 🙂 I would love to visit this Verrazzano winery, sounds fabulous! Thank you! Verrazzano winery is definitely worth a visit. I stayed in a refurbished old guest house down the hill from the castle, but hiked up to it for a fabulous breakfast every morning through the vineyard! That sounds like a dream!! Was your guesthouse good?? I would love to do something like this! Thanks for sharing your favorites. Each time I visit a new city, I have a new favorite! Great picks! Small backstreets of Rome are fantastic. I love wandering around Piazza Navona and Ghetto. Yes, I do too! The old Jewish Ghetto is fabulous. Love to revisit! Great choices – delights for ALL the senses! Good choices. I will have to try to scout them out next time. I only knew Cafe Della Pace. The restaurant in Trastevere look new tome. Hi Penny, thank you for your comment. 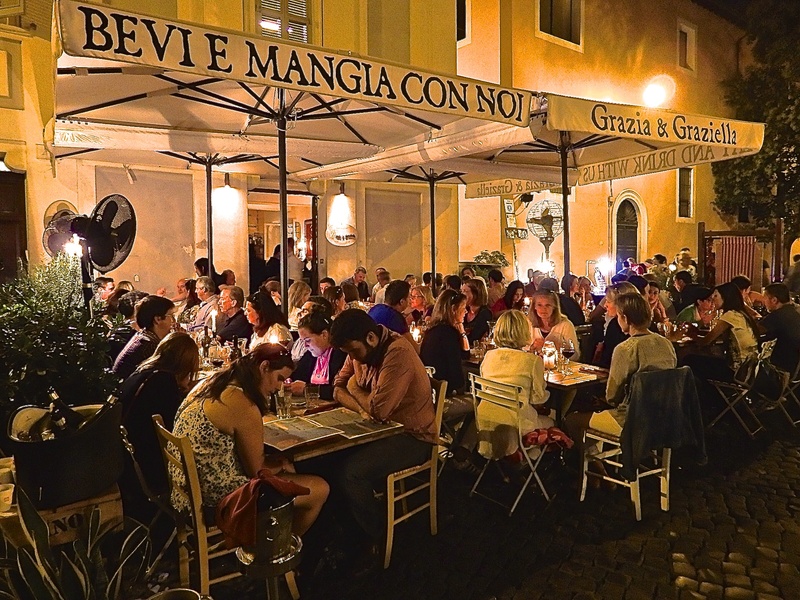 This restaurant in Trastevere was very good, and I loved the ambience. Great list Susan! Have you ever done the walk from Santa Margherita to Portofino? It is really nice.. Just love Santa Margherita in general and all of the other places you mention. Thank you Diana! No i’ve yet to do this walk but it’s on my ever growing list. ohhhhh….yes….DO check it out next time you are there….we found it by accident and had no idea that path connected to Portofino…ha, ha, ha….we had the stroller and everything…..what a a fun memory. Anyway…there are some cute cove type beaches along the way, so bring your swimsuit! Definitely my kind of place! How long is it? Day, half day? Sounds fabulous.. The walk was only a few hours (if I remember correctly)….I was a little scared..we saw boar on that walk…but they left us alone…still…I would never want some boar charging after me – especially with the stroller! boar is a concern for me too! I would prob panic and but the stroller between me and it without thinking about the poor baby! Ah well, this walk is in my future. thanks for the info! Nice post! You picked some good ones, although I’m sure it was HARD to narrow it down to five!! I have not been to Santa Margherita, but it looks amazing. Thanks so much Rick! I appreciate your support. It was incredibly hard to choose only 5!